There is no doubt trees can cause damage and be damaged in storms. However, appropriately placed and maintained trees can help reduce damage to structures in storms by deflecting wind, and reduce damage to trees. Appropriate actions includes proper placement and planting, and structural pruning prior to the storm. Species selection can also be somewhat helpful in avoiding some damage. 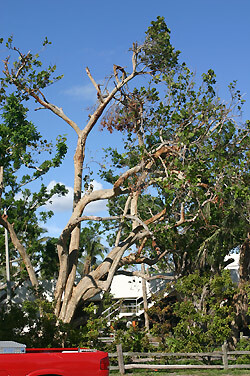 Actions in the weeks and years following a strong storm can help bring damaged trees back to health.